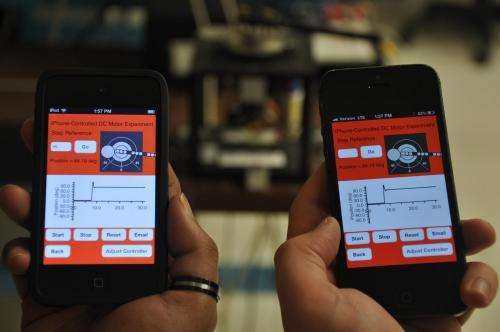 Professor Vikram Kapila and doctoral candidate Jared Alan Frank of the Department of Mechanical and Aerospace Engineering outlined how their low-cost systems work and examined the educational impact of their apps in a recent issue of IEEE Control Systems magazine. Kapila and Frank developed mobile applications can serve as interactive learning aids and are useful for students with situational impairments or special needs. Using different hardware and software setups and varying selection criteria, such as budget, nature and number of test beds, and the average number of students who simultaneously interact with the test beds, Kapila and Frank developed and studied the feedback control of the experiment and the wireless communication using iDevices such as iPod, iPhone 5 and iPad. Students who received formal training in the Automatic Control Laboratory course found mobile devices made adjusting controls and reference values easier. Instead of moving from test bed to computer to record and analyze, students became immersed in the experiment itself when using the convenient portable devices. Students encountered no difficulties using the applications, whether they had knowledge of the controller or not. By allowing multiple students to simultaneously connect to the experiment, the apps afforded deeper engagement and learning for even onsite students.